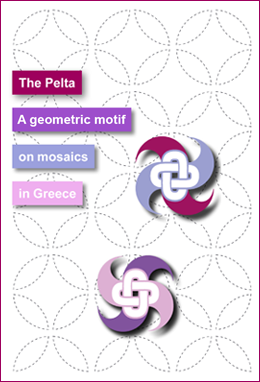 This study concerns itself with the pelta motif on Roman mosaics in Greece. The aim is to show in what form and in what repeat patterns the pelta is to be found on Greek soil. Naturally, the analysis can only concern itself with those pelta mosaics that have already been published and made known to a broad specialist audience. It can’t be ruled out that there are other variations in Roman Greece and the Greece of Late Antiquity that aren’t dealt with here. In any case, the material introduced here provides information about preferences concerning the use of the motif in different regions and eras.